This toddler bed was made using plans we found free online and modified to make them work best for us. Also "free" were the materials as they were all leftovers from other projects, so the wood was all found in our shed. So, with about 1-1/2 hours and no money we were able to make a new bed. Fun! We've had Romeo for several years now. We took him in when our friends the Pareigat's needed to re-home him. We gave him away once to Steph's sister Carrie at a time when she needed him much more than we did -- and he needed her! When Carrie needed to get rid of all her pets we took Romeo into our home again. Over the last year he's struggled with strange little issues. Last summer he had a couple of seizures and has never really been the same since. In the last couple of months things have gotten worse. We debated over re-homing him to someone without children (one of his issues was being more touchy and snapping at the kids), but in the end decided it would be unfair to expect someone else to deal with the issues he was having. (I'll spare you the details -- they're gross.) This morning, Uncle Bob came and picked up Romeo for one last ride. He'll be heading off to "doggy heaven" sometime later today. The kids are handling it quite well. It sure will be strange not having him around! And, I'll have to sweep my floors much more often... he was great for cleaning up all the crumbs and food the kids dropped. LOL We will miss him, but know that this is the better choice for him. I love Spring. Fall is my favorite season, but Spring has it's own merits. Yesterday I was able to open a couple windows in the house. Later, after the windows had been closed, I came upstairs and stopped to take a deep breath. The scent of spring was in the air! It was glorious! Today I am working on washing all the bedding and I will definitely be hanging things on the line to freshen them up. There are few things better than the smell of sheets that have hung on the line, soaking up the breeze and the sun. There is something so comforting about that smell. The sounds and sights of Spring are great as well. Hearing the birds singing as they come back to our yard after the cold winter. Seeing the cardinals in the bushes next to our house. The trees are beginning to "fluff" as they bud, waking from the dead of winter. Thank you God for your wonderful, majestic creation! My great-uncle Johnny sent me an email with a song. I couldn't help but share... follow this link and scroll to Two Trillion Tons. Click the link included there to hear the song. It was a beautiful Easter Sunday. A little cool because of the wind, but not so much I couldn't get a picture outside of all the kids in their Easter duds. The girls were all wearing outfits they'd never worn before, but none of them were new... except for Jericho. I made her dress. I don't have those pics on the computer yet, but will be adding one soon! :) Levi wasn't a very happy camper, so I only got two pics, and this was the best one. Our day was quite enjoyable. Very subdued. Church was wonderful. After church we came home and had leftover pizza for lunch. All the kids took naps (and Tim and I did too *grin*). When we all woke up we headed over to the Theis' for a wonderful meal and time with friends. They have hit our house. I had a 4 a.m. wake up call from Chase who threw up on his bedroom floor, and on himself. Levi spent the weekend with Grandpa and Grandma Osell and I called to see if they could keep him a while longer so he wouldn't be needlessly exposed. Grandpa said Levi wasn't feeling really well - he kept telling them his throat and his knees hurt (what that connection is, I don't know LOL). About an hour later, my mom called to let me know she was sorry but she was bringing me another puker. :( High fevers - Chase has had a fever, meaured in the ear, of 102. Boy am I gonna' need prayer this week!! Jericho is so stuffy she can hardly nurse, Victory is hacking, so is Shi. "I will not get sick, I will not get sick, I will not get sick..."
Photo: Taken 3 years ago. 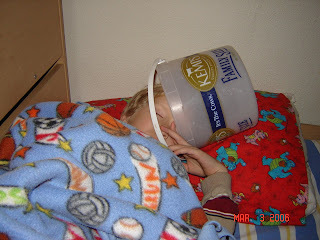 Alex went to bed sick with a bucket and fell asleep. When I went to check on him, this is what I found. I didn't realize is until after I'd take the pictures. I struggle almost daily with the question of what it is I want to do with my life. What is the direction I want to be headed? And the answer at this point is unclear. I guess I know what I would like to see happen, but don't know how to get there. What can I do to achieve the desired result? I am unorganized and unfocused. I flit from one thing to another, never really feeling like I'm getting anywhere. It's like constantly going in circles. And what, perhaps, frustrates me most is the knowledge that my children are learning from my actions (or my lack of action). I need to be teaching them. Do I want them to grow up to be like me? not the me I am now, certainly. So why doesn't that motivate change? I feel as though I'm stuck. I love the life I've been given but don't know how to live it. Mostly I wish I could go back to a certain point and start over. But I know that's not possible. I can not undo choices I've made. So how do I become what I want to be? What I know I can be? To be honest, I'm afraid. What if others don't like what I become? And maybe worse is the prospect that I won't like what I become! But then again, why should that stop me? I already don't particularly like what I am. Could it really be worse? And so, I need to make changes. But where to start? What comes first? I want to make a contribution. How do I do that? Sometimes I feel like I've made steps in the right direction and then my best laid plans are derailed. Some of the changes I want to make aren't about who I am. I would love to give my kids a nicer (ie. larger) home. Someplace with room to run. A pace that is open. A place where we can spread out some. For those sorts of change we need money. And I don't really see how we can achieve that. I'm also a bit afraid that even being more organized in the space we have wouldn't make a difference. If it's more about me and where I'm lacking, I don't think I want to know! What about diet/health changes? That's another area where I feel I'm in a rut. I can't make changes for myself without changing things for the entire family. And they are much more resistant. I'm so used to buying the same things when we shop and cooking the same things week to week, and offering the same snacks day to day. Of course the simple answer is to make a menu. But I need to have Tim on board. I just don't see that happening. One of the complaints I have is that I don't have the time to do the things I'd like to do. But the pure and simple truth is, I don't take the time. My priorities are messed up. What kid of mom, wife, woman do I really want to be? How do I escape from my current reality and create the new, desired reality? What is my first step? I just don't even know. I'm afraid to try because I've failed so often. I want someone to take me by the hand and give me a step by step guide for my life. I want to know that I matter to the people who matter most to me. Do I matter enough to any of them that they would be willing to walk through this with me? I really don't know. The more painful truth is, I don't think I matter that much to any of them. And maybe, that is why I feel so stuck. So, there you have it. My heart... bare.